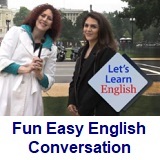 ﻿ Fun Easy English - new classroom free online classes english language lessons speaking listening writing reading january 18. 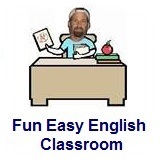 Today in the Fun Easy English classroom you are going to learn about and listen to the differences between American and British English and watch a few really cool movie trailers. Hi. In the classroom today you will learn some differences between American English and British English. Anyone who has studied English in America and in the United Kingdom knows the differences between American and British English. These differences can be confusing to someone who is beginning to learn English. Many movies such as the newer James Bond movies use both American and British English. American English tends to be faster and more difficult to understand. In addition, American English uses a lot of slang, idioms, and reductions. British English is generally easy to understand but not as widely spoken. The spelling of many words is different such as the American spelling of COLOR as opposed to the British spelling of COLOUR. Pronunciation is often different and even completely different words are used to describe the same thing. It is important to understand the differences between American and British English. GoldenEye. In the film, Bond fights to prevent an arms syndicate from using the GoldenEye satellite weapon against London in order to cause a global financial meltdown. Many movies such as the newer James Bond movies use both American and British English. Try to listen for the differences. Tomorrow Never Dies. Bond tries to stop a media mogul from engineering world events and starting World War III. Many movies such as the newer James Bond movies use both American and British English. Try to listen for the differences. The World Is Not Enough. The film's plot revolves around the assassination by Renard of Sir Robert King and Bond's subsequent assignment to protect King's daughter, Elektra, who had previously been held captive by Renard. During his assignment, Bond unravels a scheme to increase petroleum prices by triggering a nuclear meltdown in the waters of Istanbul. Many movies such as the newer James Bond movies use both American and British English. Try to listen for the differences. What is my favorite English? American English of course. I am originally from Buffalo, New York and I speak with a very standard American English accent. Why is American English my favorite? I think it is the easiest to understand and learn due to the wide use of American English in the media including Hollywood movies, television, radio, newspapers, and magazines. Yup I know some of you out there will post some comments about this. Go ahead. It is always nice to know the thoughts and opinions of others. 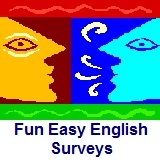 Survey: What is your favorite English? Everyone has a preference for learning a certain English dialect. 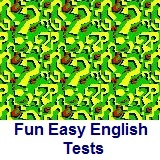 The following test is 100 questions which made this a very long page. Can you take the entire test? If you make it to the end, post a comment at the bottom of the page. lol. This is a test of your understanding of the differences between American and British English. There is a total of 100 questions. For each question decide if the word in bold print is American or British English? Good luck. 14. house (one story), bungalow? 15. loo, the toilet, bathroom? 28. charge call, collect call? 32. postman, posty, mail carrier? 36. zip code, post code? 39. car park, parking lot? 50. chat show, talk show? 52. cotton candy, candy floss? 56. pastry base, pie crust? 66. license plate, number plate? 70. private school, public school? 71. state school, public school? 79. picnic basket, picnic hamper? 80. jacket potato, baked potato? 83. call (on the phone), ring? 85. lollipop man, crossing guard? 86. bin, dustbin (outside), trash can? 96. on/off ramp, slip road? 98. kitchen towel/paper, paper towel? 99. motor/carriage way, freeway (expressway)? 100. off licens, offy, liquor store? In this lesson Anna reads the news for the first time. She learns that there is a right way and a wrong way to read the news. Caty: Now, Anna, remember. When we read the news we are always reading facts. We never show our feelings. Caty: Great. Are you ready? Caty: Okay, let’s try the first story! Anna: Hello, and welcome to The News. Anna: A new book is very popular with children and families. This is it. Anna: It is about a lost duckling. The duck's mother cannot find him. Caty: Stop! Anna, when you say the words “duck” and “duckling” you look really sad. Caty: Yes. Sad is a feeling. Anna: Sad is not a fact. Sorry. Let me try again. Caty: Okay, she’s trying again! And go. Anna: Hello, and welcome to The News. A new book is very popular with children and families. This is it. Anna: It is about a lost duckling. The duck’s mother can not find ‘im. But a family gives him a home. Caty: Stop! Anna, you are doing it again. Anna: This story is very sad. Caty: I have an idea. Let’s read the second story. She’s reading the second story. And … go! Anna: Hello , and welcome to The News. In Indiana, a grandmother is the first 80-year-old woman to win The Race Car 500. Caty: Stop! Stop! Anna, please -- no feelings. Anna: Right. But it is awesome that an 80-year-old grandmother wins a car race. Caty: Just the facts, Anna. Anna: Hello, and welcome to The News. In Indiana, a grandmother is the first 80-year-old woman to win The Race Car 500. Anna: I am very happy for her! Caty: Stop, stop, stop!! Anna, you cannot say you are happy. Anna: But I am happy. Caty: But you can’t say it. Caty: This is the News. Happy and sad are feelings. You can’t have them in The News. Anna: Okay. I got it. Caty: Okay. Let’s try the third story. She’s reading the third story! Anna: Hello and welcome to The News. Anna: What?! That makes me very angry. Caty: No, no, no! Anna, you cannot say you are angry! This is The News!!! Anna: What can I do, Ms. Weaver? Take out my feelings and put them here … on the news desk? Caty: Yes. Yes. That’s right! Now you’ve got it! Caty: Let’s repeat the first story. Anna: This is going to be a very long day. Anna reads the news for the first time. She learns that there is a right way and a wrong way to read the news. This video teaches about shortened forms of object pronouns that begin with a /th/ or /h/ sound. You also learn about two different ways to pronounce the "s" ending on verbs like "talks" and "says." Indiana – n. state of the U.S.
win – v. to achieve victory in a fight, contest, game, etc. In this lesson, Anna is nervous because she is reading the news for the first time. How do you feel when you do something for the first time? Write about it and tell us about yourself or a friend doing something at work or school for the first time. Write about it in the Facebook Comments section below. Use the Activity Sheet to practice writing and using ordinal numbers. Click lesson activity to get the printable PDF version. The page opens to a new window.